M3 is the ultimate main monitoring solution, combining world-class driver and cabinet technology from Dynaudio with cutting-edge signal processing and amplification from Lab.gruppen and Lake. 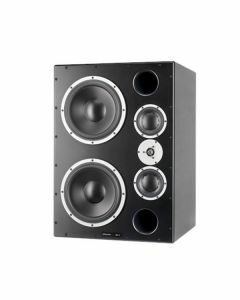 The Dynaudio Professional M3VE monitor system that takes monitoring to a whole new level with a significant upgrade from its predecessor - the renowned M3A 3-way monitor. Two speakers are powered by a single four channel Lab.gruppen PLM 12k44 amplifier, using the integrated Lake active cross-over between LF and MF, while passively filtering the MF/HF cross-over point. With Dynaudio ESOTAR² driver technology, M3VE takes over where most other monitor systems give up. Attention to detail, underpinned by a 22Hz - 21kHz frequency response and beyond 133dB SPL, M3VE leaves no room for desire in terms of resolution, range or power. Please visit http://labgruppen.com/series/plm-series for more information on the amplifier.